I should have been running a training course in Glasgow today. But yesterday, having very little voice and rather less energy, thanks to a rather stubborn cold, I decided I’d better cancel it. It looks like it may have been the right decision as trains have been stopped on the East Coast line tonight and Newcastle station closed due to flooding. We stood and watched the black cloud roll over the hill and across towards my workplace. Sheet and forked lightning sparking the distant horizon as the sky grew darker and darker, until the houses disappeared and we were in the heart of the storm. After an impressive rendition of the BBC sound effects CD entitled Frankenstein’s Castle, it swept off swiftly followed by rain of biblical intensity. My homeward journey, which normally takes about 30 minutes by car took almost 2 hours. And I was one of the lucky ones. With Metros off and people stuck in offices, many were left walking or plodging through the sodden streets. I’d normally have a wetsuit in the back of the car on a Thursday night. I wonder how they got on at the open water swim session? I am feeling much better after a frustrating few days with this cold. It’s never been bad enough to keep me off work, but it has put paid to any training. And left me wondering whether or not to start Sunday’s tri. Yet again, I find myself feeling less fit than I would wish. But on some good advice, I haven’t written it off yet. I may try a gentle run, as per my plan tomorrow. Just a leg loosener, to see how it feels. And if that feels good, then yes, I think I’ll give it a go. But no pressure. You can now see another version of my report on the first Whitley Bay parkrun on North East Runner. I hope to keep writing articles for this new and growing website, so if there’s anything you’d be interested in hearing, let me know. After an inspiring and emotional day watching the Olympic flame being carried through my home borough of North Tyneside yesterday, it was time for me to stick my trainers on and take part in my regular Saturday morning ritual at parkrun. 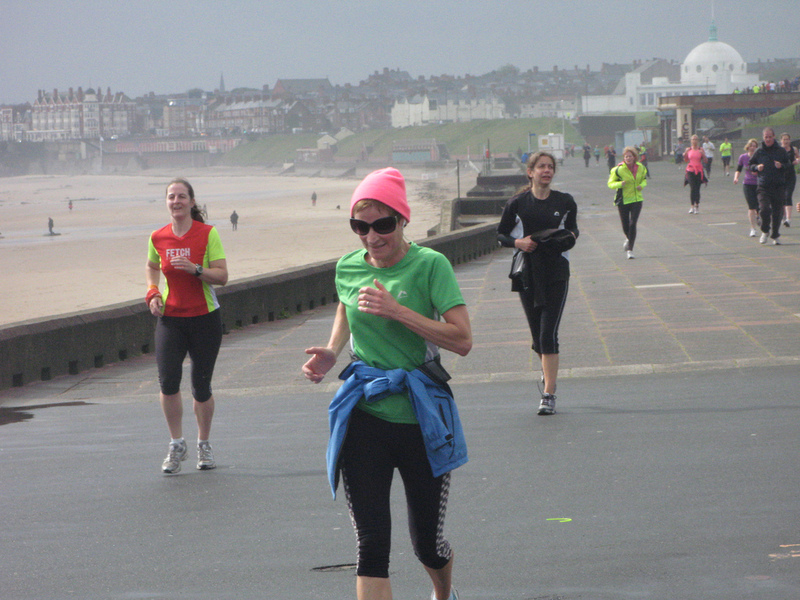 Only this was a special parkrun – the very first one in Whitley Bay. It’s been a tough one to get off the ground and I’m sure at times the volunteers who organise it thought it would never happen. But finally, North Tyneside council were won over and elected mayor Linda Arkley was on hand to give the new parkrun her approval. Even on a grey and overcast day this has the makings of a lovely parkrun course. With a backdrop of the sea and traffic free paths along the cliff tops, it’s certainly scenic. The two lap route and change of terrain, with a couple of short inclines make it a decent challenge too. The hills aren’t too scary – honest! Starting from Panama Gardens, you run on the well used paths over the Links towards the War Memorial then turn along the path nearest the coast towards St Mary’s Lighthouse. The route goes up and around down to the promenade alongside the popular skate park. Along the promenade, past the Rendezvous Cafe is a nice long wide stretch with plenty of chances to pick up the pace, or just admire the view of the beach just feet away. Towards the end of the path, marshalls direct you up a small bank and onto the light coloured paths that take you over a small stream and up around another short climb to emerge on the footpaths just before the Briar Dene pub. Then there’s a sharp left turn back onto the links, heading slightly down hill and a swift right hand turn up the bank to run along the cliff top path looking down over the promenade. The path is slightly narrow and rougher underfoot here, but it gives you good views of the other runners. Back towards the start and at the war memorial, the cheery marshals will tell you you’re more than half way round as you repeat the route for another lap, finishing just short of the starting point and being funnelled into place on the grass. I really enjoyed seeing so many familiar faces and getting a few shout outs as I ran. The lapped route gives you a good chance to see other runners, which can be either encouraging or demoralising depending on your attitude. And the change of terrain also helps keep things interesting. With local cafe, the Boardwalk offering bacon butties and drinks (and a parkrunners discount), it’s also a good chance to catch up with my running pals. Hats off to Heather and her Whitley Bay parkrun crew for not only getting this event off the ground but coping with a large field of runners for a first time event. As far as I could see, everything ran very smoothly and the cheerful and encouraging marshals were very welcome. And it was good to hear people just passing by afterwards taking an interest in what was going on too. It deserves to be a popular and well supported event. I’m almost scared to write this in case I jinx it, but it feels like I’ve made real progress with my open water swimming. Immediately after my first open water swim triathlon, when asked about the swim, I replied that it had been ‘okay’. Not fantastic, not amazing, just okay. But buoyed by the adrenaline of completing my first race at this distance and enjoying a fabulous day with my friends, that got lost in the general high. 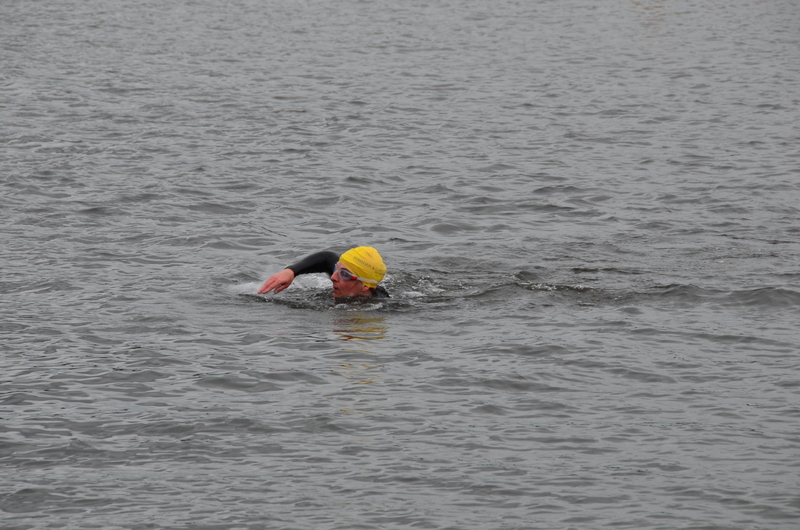 I know I struggled to calm myself during the first part of the swim and was frustrated by my breathlessness. I know I had doubts in my head even as I swam and wondered how I would ever be able to get over them and swim further. But I did it, which was all that mattered. And knowing that I had done it would give me confidence that I could do it again and do it better. And then a strange thing happened. I was happy to take a couple of days off to recover from the tri, but when I got back into training, I had a real desire to swim again. And not just in the pool. I wanted to go back to the lake and swim in the open water. Like the itch of a run after a good while static, I felt the pull of the water and wanted to be swimming again. The open water swim sessions are on Thursday evenings. I usually train with my PT early, before work on a Thursday morning, so it’s quite a demanding ask for me to make both sessions. But I really wanted to go. Even with the prospect of a race on the Saturday evening, that I knew I’d be wise to rest for, I wanted to swim. Ian was kind and we did a light training session, still enough to wake up my muscles in my legs and upper body. And all day I watched the weather, wondering how it was going to turn out and whether he would, as he hinted he might, make it along to the swim session too. Once out of work, I was quickly at the lake, changed into my wetsuit and ready to go. Chatting to a few tri club mates and comparing race stories before I spotted Ian and Lee and we all got in the water together. With different groups doing fast sets around the buoys or longer swims further up the lake, I was just happy to pootle round the buoys at my own speed as I have done in previous sessions. Although it felt great to be in the water, and it was clearer and even felt a bit warmer than during the tri, I soon found myself flooded by the familiar feeling of being out of control, nervous and breathing patchily. A bit of time out in the shallows and a quick chat with Ian who was having problems with his goggles and I set off again for another lap. A little better this time, but still struggling to get my head in, breath out and smooth my stroke. Still feeling anxious, frustrated and worn out by a relatively short swim. ‘Oh well, something to work on,’ I thought as I headed back round for another rest. One more lap for tonight and then I’d call it quits. That third lap was somewhat delayed as the fast group came round and I let them get out of the way. Meanwhile, I’d also found Ian again, still suffering leaky goggles, and another girl who was quite happy chatting to us. Eventually we set off again. And whether it was knowing that Ian, who I trust, was swimming nearby, or that I’d given myself time to get used to the water and finally relaxed, thinking it was to be my last lap, but suddenly it worked. And I was swimming. Nice slow, easy strokes, giving myself time to breathe to both sides. Striking out towards the buoys, head in the water and making progress. I swam to the first buoy and then swam alongside another girl, drafting her to the second. The cool green water flowed over and around me. I watched the bubbles emerge beneath the surface and came up for air, glimpsing at the trees and the lake. Round the second buoy and back towards the shore, I boosted my kick and felt myself glide through the water. Filled with confidence and enjoying the water, we did another lap, not really swimming together, just being conscious that there was someone near by. And I had another lovely smooth swim, all the way round front crawl, just lifting my head to sight and enjoying the swim. I don’t seem to have suffered any bad effects from a double session Thursday before the Blaydon Race on Saturday. In fact, given the weather, you could say the swim was good practice for the run! And on Sunday, when my legs were aching after racing, where did I end up? Yes, back in the water at the pool this time for a nice leisurely shake it out swim. And I was cool, calm and felt like I could have swum all night. It was a great recovery set. Another Thursday and another sunny start to my day, down on the beach, training with Ian. A complete body workout to strengthen muscles, improve balance and work my core. We talked a lot about training in general and the benefits of a complete programme with weights and resistance as well as the cardio work. I like the way it makes me feel and the hour passes quickly. After work, I got to the lake early, looking forward to the swim. With the sun out, the lake was warm – 17C, we were told. But there was quite a breeze and the surface was a little choppier than I’ve been used to. I took my time getting in the water, floating on my back and trying to relax before I set out to swim around the buoys. Consciously, I felt calm, but as before, I couldn’t convince myself to put my head in the water until part way round the first lap. And when I did, I was holding my breath and then struggling to control my heart rate. A bit of breast stroke and treading water to settle myself and I kept trying. Swimming with my head out of the water inevitably resulted in a gasp of water as a stray wavelet hit my face. I did have moments of it coming together and feeling quite pleasant, but they never seemed to last long enough to allow me to swim one complete side of the triangle consistently. But I managed 3 laps, around 750m in total and it’s all good practice. Maybe I had set unreasonable expectations, hoping to get in and instantly feel at ease. I should be happy with feeling more under control and less panicky. Thinking about it on my drive home, I realised, although I enjoy the open water swims, they are probably the most stressful thing I do. Although stressful maybe isn’t the right word. They are the thing most likely to make me feel anxious, not in anticipation, but while I’m doing it. But that doesn’t mean I’m going to stop. Because how fortunate does that make me? That my biggest worry is something I can and am controlling, little by little. That it’s something I choose to do and actually something that I can glimpse I will enjoy. I wish all my friends could exchange their troubles for such easy anxieties. There was a moment when I thought once again, why do I want to do this? What’s the sense of putting myself through another open water tri? But if I want the adrenaline high, the confidence and self belief that my last one brought me, that’s the price. It’s like riding the roller coaster or travelling on the ghost train, you have to have the scare to get the thrill. And this is far from an unbeatable challenge. It’s a manageable one. Even if I was twice as scared, my sheer stubbornness would get me through. But actually, I do quite like the challenge. If it was easy, it wouldn’t be a test. And I know, because I’ve felt it, that open water swimming can be joyous and liberating. Even coming home smelling of rubber and duck poo, I was gratefully not to be snotty and sneezing from the chlorine. I’ve no doubt, I will go through the ups and downs of swimming again as I seek to improve on both speed and distance. I have one more open water, and a couple of other tris that I’m looking forward to this year, and big plans for 2013 already. So, as Dory says in Finding Nemo, ‘Just keep swimming’. 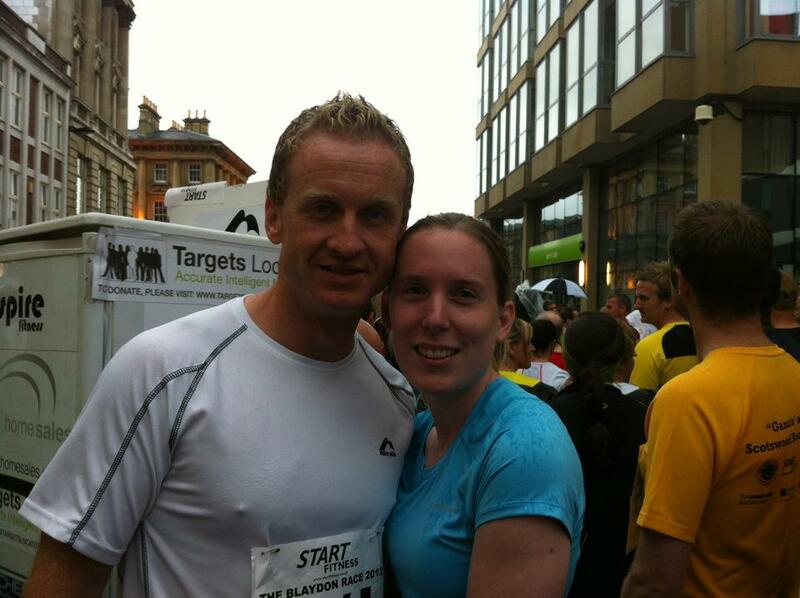 Blaydon Race 2012 – the wet one! I think the correct description of the weather conditions in the first mile or so of this historic race is ‘stottin down’. The 150th anniversary and the bells of the cathedral rang out at the start, commanding Noah-like floods to wash away the unworthy. Gathering crowds and clouds in the Bigg Market. Mingling with regular city revellers enjoying a drink or a bite to eat on the way down to the start. Spotting a few familiar faces as I warmed up and heading to the start with Ian, Kelda, Big Les and Tony the Fridge. A rousing chorus of the song and then a wait and a wait for a sign of the start. Shouts of good luck and enjoy and I was away over the cobbles and onto the road. Despite the drizzle, there are smiles and cheer. I pick my way through the crowds with no problems. My legs feel fresh, I’m ready to go. My mouth is a little dry from the excitement, so I stick out my tongue and drink in the raindrops. Out into the space of the Scotswood Road and it really is pouring now. 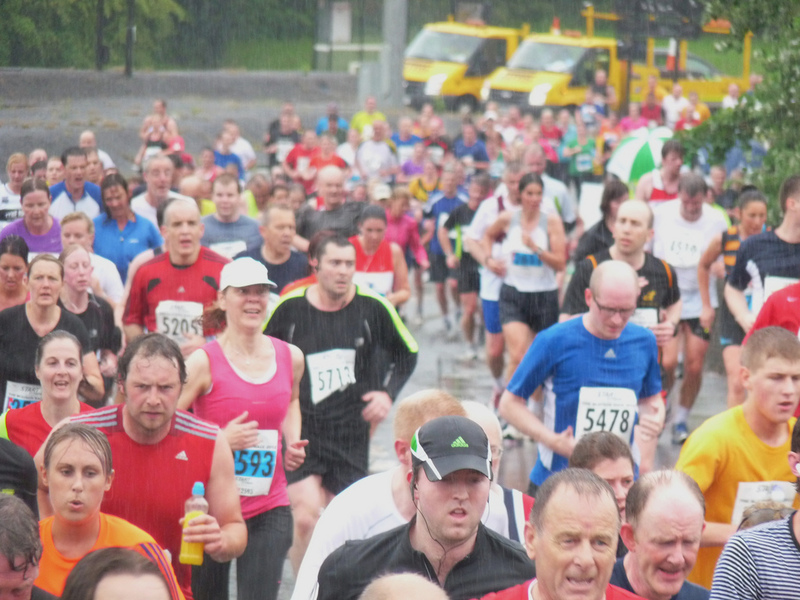 Runners split and divert onto the paths, dodging puddles across the carriageway. I pick up my feet and splash on through, my shorts slick and sticking to my skin. Supporters huddle under umbrellas or cower at bus stops and there are a few shouts back from the runners as we clear rain from our vision and plough on. “You’re not laughing now?” says one man to a girl running beside him as we splash through another road river. “No,” she replies, but she is. So many people I know are here, work colleagues, parkrunners, Fetchies, friends and twitter connections. I manage to spot most of them somewhere along the route. I manage a wave to Diane in the crowd at the start. 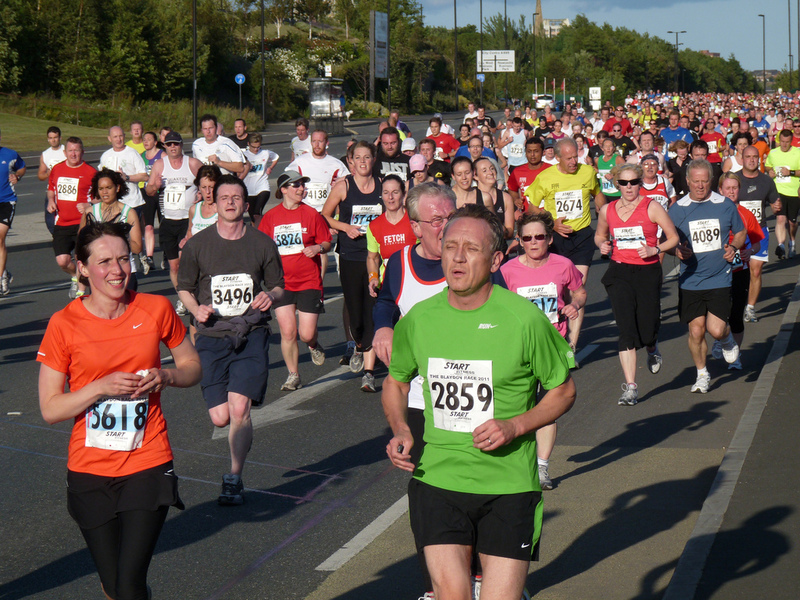 On the Scotswood Road, there’s Penny, hair plastered to her head and then Danni running with another Tyne Bridge Harrier. Shout outs along the way and I’m running strong, enjoying the rain and the feeling of freedom. Somewhere along the road I fall into step with Tove from parkrun. She says something that sounds a little down hearted and I know she’s afraid of aggravating the injuries that hold her back. But I know that on form, she’s a bit better than me. Not so much that I can’t catch her on a good day, but enough to spur me on. A lovely nemesis to have. I say something about not talking yourself out of the race, but talking yourself into it. For I am bubbling with confidence. Still on the updraft from my triathlon. Still happy to be asked about it at parkrun and at the start of the Blaydon Race. Telling the story and lifting my spirits again as I recall how it felt to finish. Right now, I feel invincible. I can meet any challenge I set myself, because I’ve already done more than I imagined I would. Tove and I run on together. We don’t say much. I’m a bit of a lone focused runner, even when I’ve just set out to run this with no plan, no pace, no target time. But I remind her as we turn and begin the climb at the bridge that Jeff will be waiting for us. She spots the parkrun cheering squad before I do and we yell out. I spot Fred and Eric and get a shout back from Angela as the hardy crew cramp themselves into a hardly big enough bus shelter. On the way up and over the the incline and away across the Tyne I blow kisses to special people – my new little brother, my nephews and my little sister Ava. I am enjoying this race. My legs are starting to tire a little, being more used to running 5ks than longer distances at the moment. But the shouts and exhilaration get me through and onto the next section, the out and back along the river. I scan the passing stream of runners for faces I know and give a shout out to Big Les, who can’t hear me, lost in his headphones. At the water station I spot a red and yellow shirt and shout “Fetchie coming up behind you,” to Minardi. I really must get my name on my Fetch shirt. I wave at the band, playing gamely on in the gloom beneath the bridge. Round to my least favourite part of the course, through a bit of an industrial estate and Tove’s beside me again, a spot of brightness in her pink top and white hat. I stick with her, though my calves are beginning to winge a bit from the cold and the up and over sections. 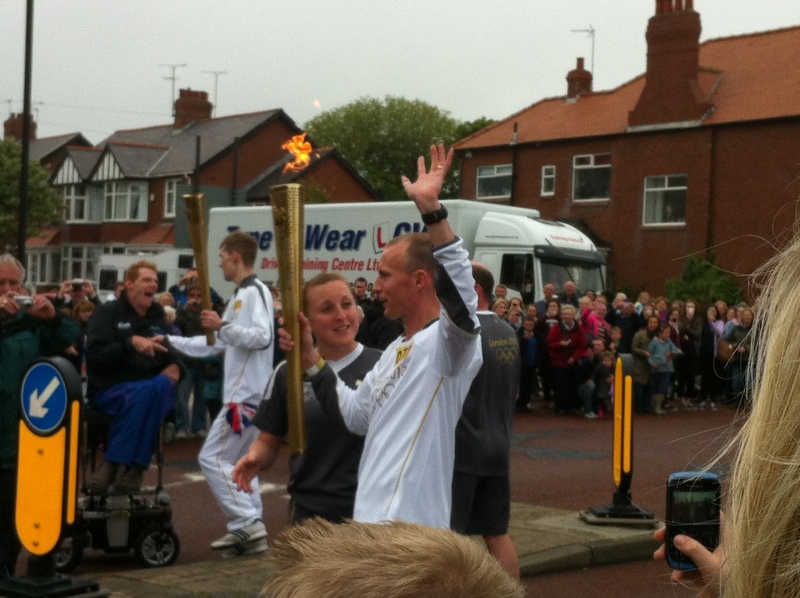 On the main road towards Blaydon she begins to pull away. For a while I dig in and stick with her, telling myself that I’ll regret it if I don’t try. But eventually her long legs pull her away. I keep her in my sights for a good long time, resolving not to let the gap get any wider. I’m not consciously slowing down, but the distance is starting to tell a little now. I haven’t run 10k since the middle of May and haven’t properly raced a run this year. My goal here is to enjoy it and run well. So I just keep going as best I can. Not fighting my pace or pushing so it hurts too much, just revelling in the run. I reckon we’ve passed four miles by now and I mentally clock this one up as six, although it’s a bit shorter. Just 18-20 more minutes of running I tell myself, and I’m actually a little sad because my heart and head are enjoying this and I sense those around me are laughing off the rain too. It’s the running madness. This thing we do, that causes the muggles to stop and stare in disbelief. This thing we know ourselves is slightly crazy. But it’s a good kind of crazy. 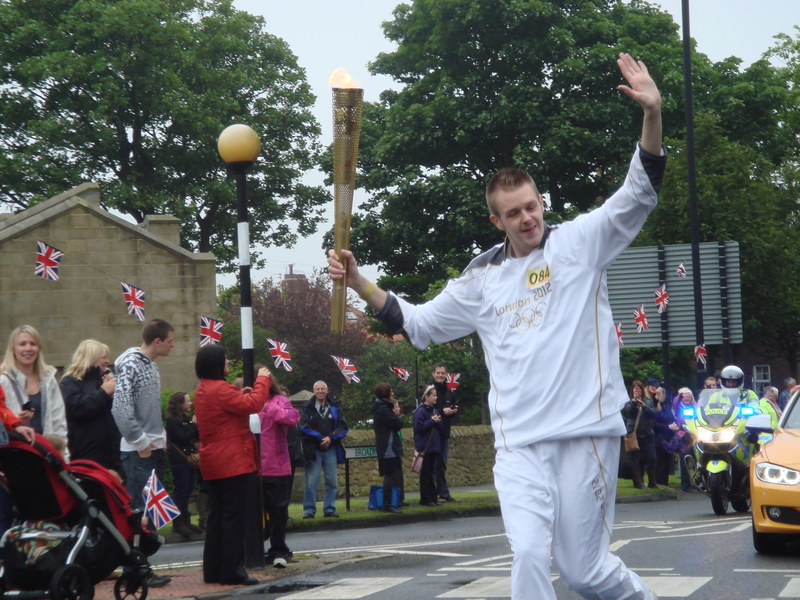 And something about the Blaydon Race, especially in the rain really celebrates that. I’m pondering the finish now as soggy spectators stand beside the road beneath umbrellas. It’s different this year and I haven’t been able to get a picture of it in my mind. We circle round beside the old finish and I spot the baggage buses and runners with goody bags coming the other way, so I know it’s close. I get a shout from the side, spectators trapped behind the fences and it’s friends from parkrun. I smile and get ready to give myself a boost for the finish. A marshall shouts “Just over 200m to go,” and I start to power up. My legs protest, too much too soon. But I continue to find a bit of pace towards the end. Over the grass and the race face is on, blurred by rain, feet finding purchase on the soggy grass as marshalls loom before me and direct me to the left into the finish funnels. I stop my watch and stumble forward, recovering my breath. It’s some moments later when I check my time – 52:00. My best ever run here, also in the rain, was officially 50:01. Last year I ran a few seconds slower than that. This year, I would have been happy with anything under an hour, secretly hoping for under 55, but telling myself that the time didn’t matter, just having a good race did. So it really is time to forget the PF. I’ve come through another race with no signs of it re-appearing. And although my focus will be on tris this summer, there should be a few pure runs where I can challenge myself and see if I can improve. I might even try to sneak in a fast 10k into a fast filling race diary as I’m not so far off last year’s glorious form as I thought I might be. And I did have a terrific race. I ran well and enjoyed it. I felt strong in my heart and my head and my legs followed. I had friends around me and smiles all the way. I finished fast and rejoiced in the racing. I wish that all my crazy running friends can say the same. And in case anyone thinks we’re all winging about the rain, honestly, I was drier in the lake last Thursday. Author The ScribblerPosted on 10 June 2012 11 June 2012 Categories runTags Blaydon, Blaydon Race 2012, blaydon race 2012 photos, blaydon race results, blaydon races, Chronicle blaydon race report, fetch everyone, Scotswood Road4 Comments on Blaydon Race 2012 – the wet one!